NOW: When most maritime work moved south of King Street to the reclaimed tidelands Seattle’s Central Waterfront turned to play and tourism. At the foot of Seneca Street this featured at one time or another Bob Campbell’s Harbor Tours, the Seattle Marine Aquarium briefly with NAMU, Trident Imports and now the flotilla of Good Time Waterfront Tour boats. 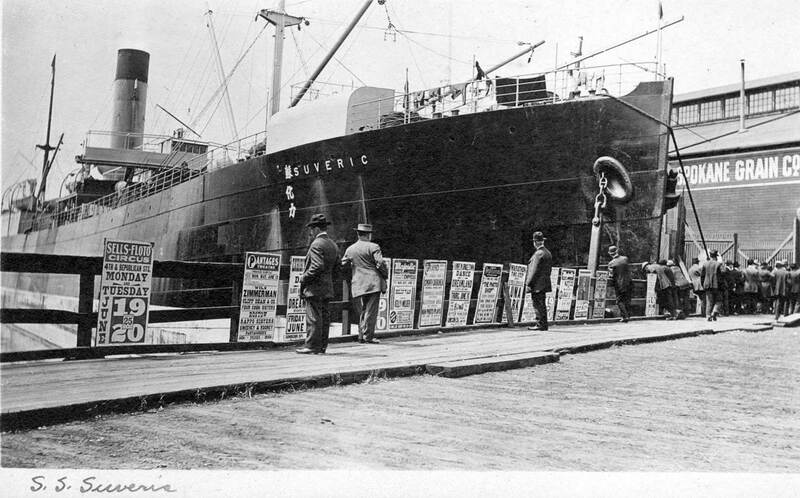 Judging from the posters tacked to the railing, the S. S. Suveric visited the Seattle waterfront sometime in the late spring of 1911. The broadsides for several popular Seattle venues: the Pantages Theatre, Dreamland, the Majestic Theatre, the Grand Opera House, the Orpheum, Luna Park (at Duwamish Head), and the Lois Theatre all promote programs that date sometime between June 10 and July 1 of that year. Its unique “fingerprint” also easily identifies the place. The windows atop the pier peeking around the bow of the Suveric are five panes wide and three high. It is Pier 56, also long known as the Arlington Dock. From the time of the Alaska gold rush in the 1890s to the First World War, Frank Waterhouse, an English stenographer turned shipping magnate, ran steamships in every direction from this slip for himself and also for the United Sates Shipping Board. The seemingly aimless “waterfront watchers” standing near the rail – especially on the far right – may wish to “go down to the sea again.” They are held above the tides on a wooden trestle. 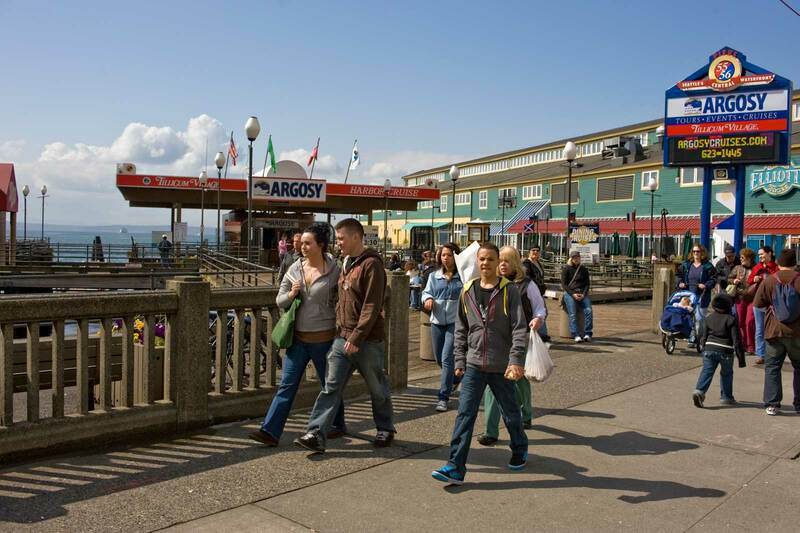 The concrete and steel seawall was not constructed here for another 24 years. Probably the S.S. Suveric’s most famous journey came soon after it was launched at Glasgow in 1906. For 52 days the 460-foot steamship carried 1328 Portuguese immigrants – 459 men, 283 women and 582 children – from Madeira to Honolulu. Thirteen children died at sea and eight more were born. F.P. Sargent, the U.S. Immigration Inspector at Honolulu, noted, “They are a good, strong, clean and fine looking lot of people. I have seen many, many shiploads of immigrants, but must say these are the brightest and best appearing lot I have every helped inspect.” And many of the immigrants carried violins.